My favorite thing to cook with my son, Archie, is oatmeal cookies. We can add spices, try something new. Adding bright red cranberries is a healthful treat. The bulk aisle has great deals on dried cranberries, and oatmeal. Check the bulk spices for lower-priced ground cardamom and whole nutmeg. Use a microplane to grate the nutmeg for extra spiciness. And the measurements below, of course, are simply suggestions. But you should wind up with one batch of fresh cookies, plus three cookie logs for the freezer. Preheat oven to 375 degrees. Prepare a cookie sheet by greasing it with butter or lining it with parchment paper or a silicone baking mat. In a large glass bowl, combine the flour, baking soda, salt, cinnamon, nutmeg, and cardamom. Let your little one stir it up with whatever utensil he or she wants. In the bowl of an electric mixer fitted with the paddle attachment, or using a big bowl and a hand mixer, beat the butter and sugars together until creamy. Turn off the mixer and let your little one scrape down the sides of the bowl. Don’t worry if some sticks to the sides; they’re just cookies. Add the eggs one at a time, beating each time. Add the vanilla and molasses. Beat for a few more seconds. Add half of the flour mixture and mix until incorporated. And the rest, and make sure it’s mostly mixed together. Remove the bowl from the mixer. Add your oats and berries, and with clean hands (yours) and mostly clean hands (the little one's), press and smoosh the oats and berries into the dough until incorporated. Using a spoon or your hands, pull off six knobs of dough and place them on the prepared cookie sheet. Bake for 10 to 12 minutes. Remove from the oven and cool on a wire rack for a few minutes, then transfer the cookies to a wire rack for complete cooling. Or just blow on them until they’re cool enough to handle, eat, and enjoy. While you're waiting for the cookies to finish cooling, roll the rest of the dough up in tube shapes and cover it in plastic wrap, then aluminum foil. Place them in a freezer bag. When you’re ready for ready-to-bake cookies, preheat the oven to 375 degrees, remove the dough from the wrapping, slice disks of cookie dough from your frozen cookie tubes, and bake them on a cookie sheet for about 12 minutes. Culinate editor's note: You can get away with using half of the oats called for, if necessary. 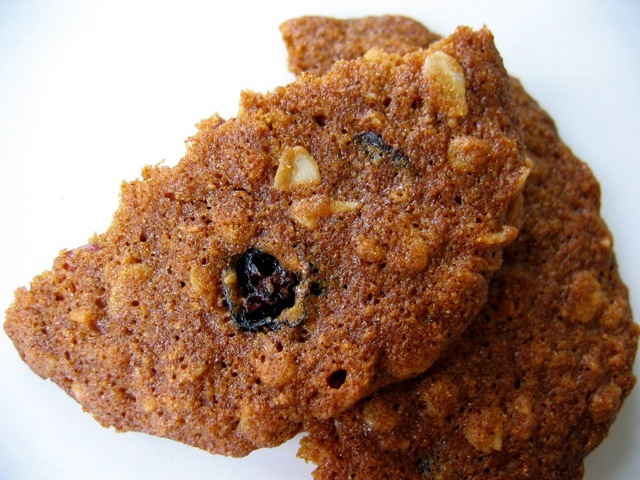 The cookies will still have an oaty chewiness, but they will bake up flatter and broader. And the extra dough will be goopier, making it trickier to roll into logs for freezing.